I was enrolled in a class called "A Sense of Place", with teacher/artist Vera Iliatova. The intensive workshops are held on the beautiful green campus of Bennington College in North Bennington Vermont, in a program through Art New England, sponsored by MassArt. The oil painting above was my final painting of the week. It's just 10' square, and by the time I had set up my easel and mixed the colors I needed, I had very little actual time left to paint, maybe an hour at the most. Yet, looking back on a week's work, I think this little painting is my favorite of the week, the most representative of "me". Not sure the photo accurately represents the colors. I can't say enough good things about the course I took. Vera challenged the 10 of us in the class, and we worked like crazy, painting well into the night. She gave us frequent and valuable feedback as we worked, and referenced numerous artists that related specifically to each of us, for us to look up. She was kind and funny and I felt like I learned so much. 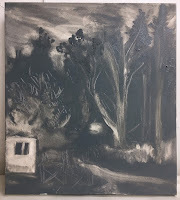 Our first class meeting was Sunday evening, after arriving, unpacking, and eating dinner, and I was very surprised to find out we'd be painting on this first night. The painting we started that night became a nightly "20 minute challenge". (Though I spent WAY more than 20 minutes a night working on it). 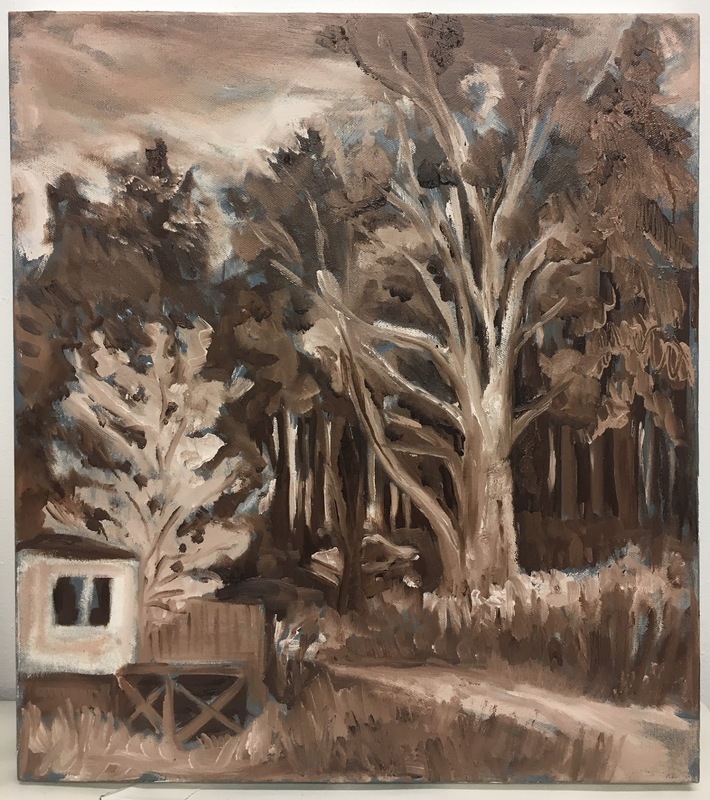 First night (pictured above): we mixed a color (mine was made from burnt umber, ultramarine blue, a touch of black, and some white) and painted it on our entire canvas. We used paint rags, fingers, and brushes to remove paint and add texture, responding to the environment where we painted. 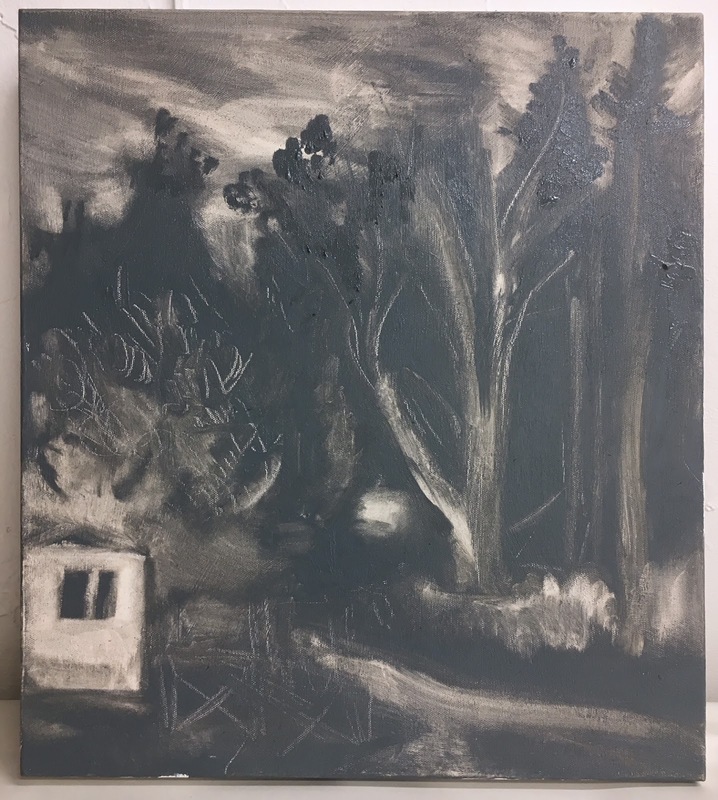 Second night (also above): we used one color of paint that had been used the first night, and with white, made a value scale of the color, and used it to alter the previous night's painting. 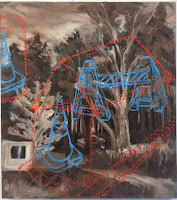 Third night: we used a color to superimpose contour line drawings of two shapes that "spoke to each other". I was inspired by the construction cones and such right in front of our studios, which are basically garage bays. Fourth night: we used a broken line of a complementary color to create a space or shape to enclose the two shapes. Mine is the little orange house. Our last night instructions were to 'bring forward' some of the original painting, and then to do whatever we needed to bring it to a conclusion. 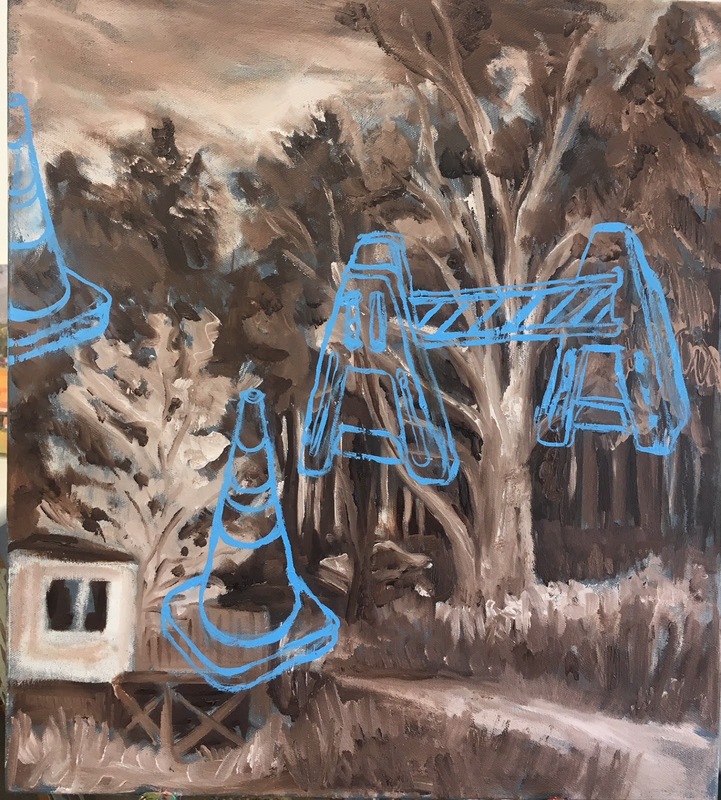 I was dying to add some orange and white to the cones and sawhorse, so that's what I did. Above is the final image from the challenge painting, but I'm afraid the photo has a poor color rendition. Looking at it now, I think I may still add another layer, very linear, with a dark brown. Meanwhile, on Monday morning, we did a one-session painting with specific color limitations. It was VERY HOT that day, over 90 degrees, so we didn't venture far from our studios to find a subject for our paintings. We chose a color that felt like the color temperature of our chosen subject, added white to make it a mid-range color, and again painted our entire canvas with the color. I picked a sunshiny yellow (cad yellow lemon). Then we used were instructed to select ONE red, and ONE blue, and wiped off and painted into this wet base color. I really enjoyed the challenge of this process; I'll do it again. The afternoon was hot, so we watched some slides, drew from books in the library, and later began a 'composite' painting project to work on almost every afternoon. I'll share my painting later in this post. On Tuesday, it was pouring rain. We set up our easels on a porch and patio of the music building, and painted. Color limitations: one blue (black or payne's gray could sub for a blue), and two yellows and two reds, one warm and one cool. I used black for my blue, since there was no blue in the sky anyhow! Here's my painting from the morning. My reds, I think, were alizarin crimson and cad red medium. My yellows were I think yellow ochre and cad yellow light. We used the same palette of colors in the afternoon, and since it was still rainy, the model that the teacher had scheduled, to pose in the environment, posed on the patio where we all squeezed in to paint. After dinner, as the rain ended, the sky went through some spectacular changes. 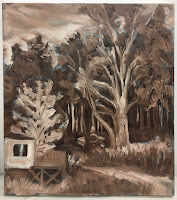 I painted this little painting of the landscape behind the construction trailers which were parked right in front of the studios. The next day, when the sky was cleared, I discovered there was a whole mountain there that was not visible when I painted!! Three paintings in one day! Wednesday, Day three, in the morning, I painted a bunch of buildings whose colors and shapes had intrigued me. I used a similar palette, but used ultramarine blue rather than black. I should note, after my previous two years painting on campus, I was wary of the abundance of green, and made a commitment to seek out other colors this year. As an unexpected result, all of my paintings include buildings this year. (Afternoon was spent working on the composite project). Day 4 in the morning I painted these buildings below. The blackish spot in the sky is something that unfortunately happened transporting the paintings home. I'm going to fix it, or add a cloud if I can't match the color satisfactorily. (Afternoon was spent working on the composite painting). The painting has a quietness not in my other paintings, and I rather like it. I enjoyed the challenge of mixing the various whites/grays for the different planes of the buildings. Friday, Day 5, was the final day to paint; I did the little painting at the top of the post. I was really smitten by colorfully dressed workmen on the roof (who sadly left shortly after I began painting!) and the sun light on the pinkish-red tarps. Here's a photo of the scene. And I also finished the 'composite' long-term painting. 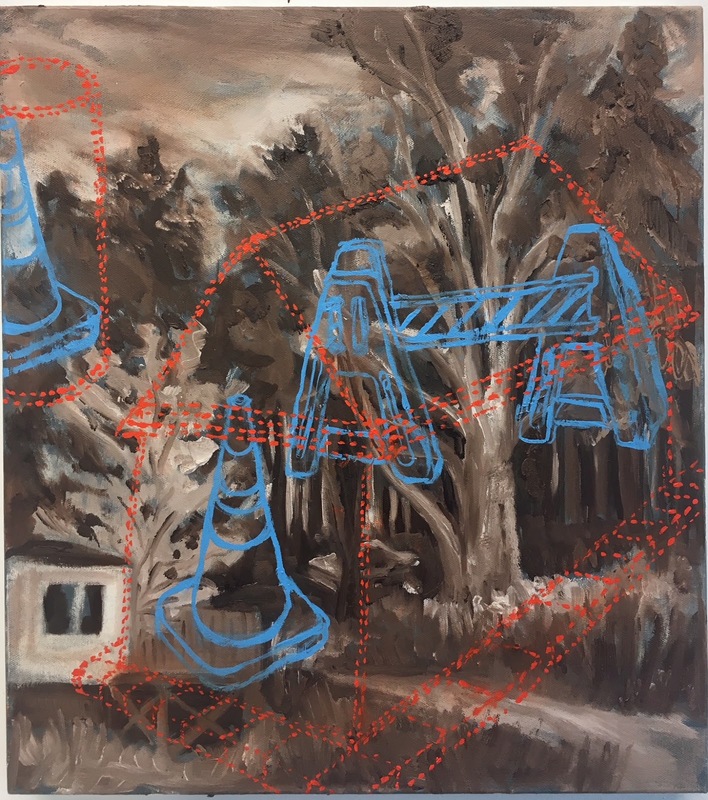 Here's the steps I took for this piece: first step was washes of paint to cover the canvas, without a real plan in mind. The next day I added some clouds and these shapes, after doing drawings in the library of antique-looking flying machines. I hated it at this point. 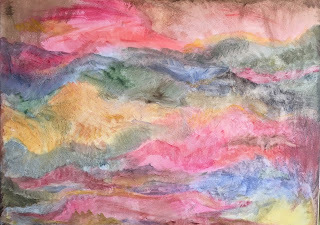 So the next day I took a rag with mineral spirits and wiped much of it off, leaving vague suggestions of the shapes, and repainting much of the sky. I started adding flying machines, and a network of lines. Here's the final piece. On Friday evening, we had a 'studio tour', where all the classes displayed all their work. My final little painting was still very wet and I wasn't sure it was finished, but I displayed everything else. Saturday morning concluded with a final critique session. I am so inspired by oil paint. 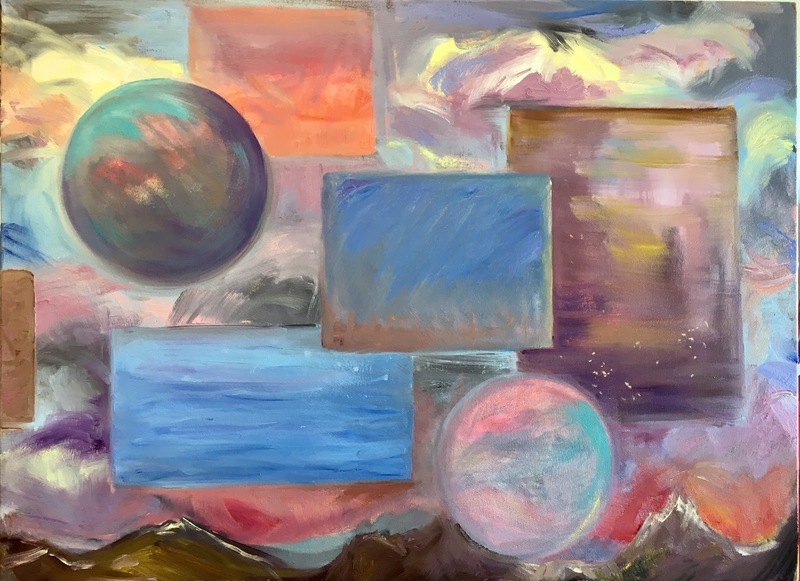 Today in yoga class, during our final relaxation exercise, I found myself planning a painting, and everywhere I go I see compositions and color I want to use in paintings too. To see my post about last year's class, click HERE. To see my post about the my first experience at Art New England, in 2016, click HERE. You'll see a photo of the 'garages', our studios, in this post.